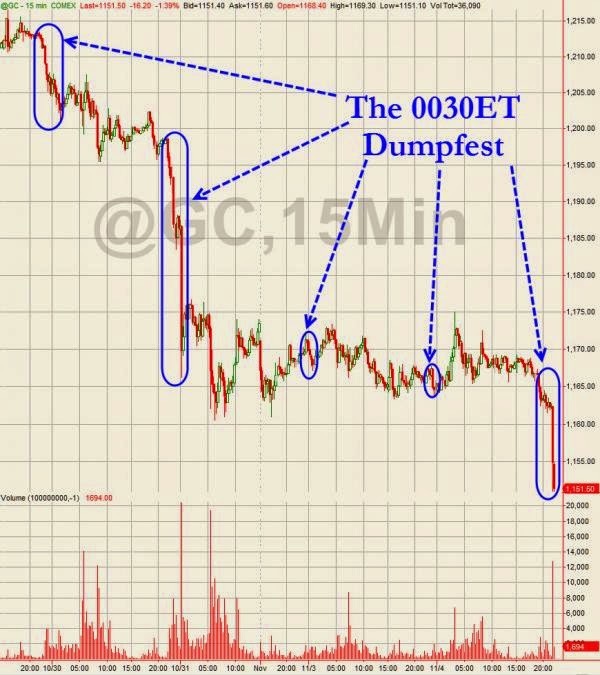 For the 5th day in a row, "someone" has decided that 00.30ET (11 am IST) would be an appropriate time (assuming the 'seller' is an investor who prefers best execution rather than the standard non-economically-rational share-repurchaser in America) to be dumping large amounts of precious metals positions via the futures market. Tonight, with over 13,000 contracts being flushed through Gold - amounting to over $1.5 billion notional, gold prices tumbled $20 to $1151 (its lowest level since April 2010). Silver is well through $16 and back at Feb 2010 lows. The USDollar is also surging.